• For quantitative determination of bilirubin and evaluation of drug effects on bilirubin metabolism. • BILIRUBIN is one of the degradation products of hemoglobin formed when red blood cells die. Bilirubin exists in the insoluble unconjugated form (also indirect bilirubin), or soluble glucuronide conjugated form bilirubin (also direct bilirubin). Conjugated bilirubin moves into the bile canaliculi of the liver and then to the gall bladder. When stimulated by eating, bile (including the conjugated bilirubin) is excreted into the small intestine, where bilirubin is converted into urobilinogen. Bilirubin is a key diagnostic indicator. High levels of bilirubin result when too much hemoglobin is broken down or the removal of bilirubin does not function properly. The accumulation of bilirubin in the body causes jaundice. Simple and automation-ready procedures for quantitative determination of bilirubin find wide applications in research and drug discovery. BioAssay Systems bilirubin assay kit is designed to measure bilirubin in blood specimen in 96-well or cuvette formats. The improved Jendrassik-Grof method utilizes the reaction of bilirubin with diazotized sulfanilic acid, in which a red colored product is formed. The intensity of the color, measured at 510-550nm, is an accurate measure of the bilirubin level in the sample. Total bilirubin is assessed using caffeine benzoate to split bilirubin from the unconjugated bilirubin protein complex. 1. I would like to know whether your calibrator is bilirubin conjugate or unconjugated bilirubin or a combination of the two. If it is a combination of the two what is the proportion? Bilirubin is not stable which is why we do not provide bilirubin as calibrator or standard. The calibrator is a dye that is stable and absorbs at the same wavelength as the product in the bilirubin color reaction. The absorbance (OD) is used to calculate the bilirubin concentration in the sample. 2. 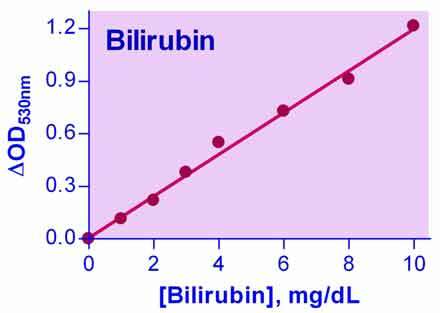 How does this measure conjugated bilirubin in comparison to bilirubin? The conjugated bilirubin (also called direct bilirubin) is measured directly in the reaction with the diazotized sulfanilic acid, whereas the total bilirubin (conjugated + unconjugated) is measured in the presence of caffeine benzoate, which splits bilirubin from the unconjugated bilirubin protein complex.